She's not in "Cougar Town" anymore. 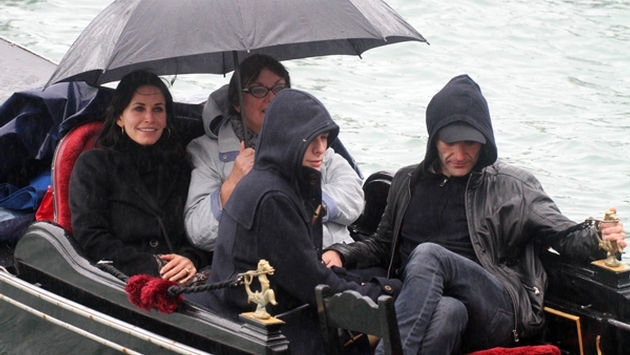 Courteney Cox and boyfriend Johnny McDaid took their romance overseas this week to Venice, Italy. The 49-year-old actress and the Snow Patrol star, 37, looked totally in love while on vacation, as they strolled through the European city together on Monday, Feb. 17. Coco, Courteney’s 9-year-old daughter with ex-husband David Arquette, was also along for the fun-filled vacation. During their stay, they were seen grabbing some gelato together! Some would argue that the city’s best gelato is served in Boutique del Gelato, a tiny outlet on busy salizzada San Lio. Others favor Alaska Gelateria-Sorbetteria, where Carlo Pistacchi is passionate about making ice cream and experimenting with new flavors, Time Out reports! Either way, trying the gelato is one of those things you must do while in Venice. Courteney and Johnny were first reported to be dating after they were spotted at Jennifer Aniston's holiday party in Los Angeles. Ed Sheeran, who is good friends with both Courteney and Johnny, introduced them to each other. "I wasn't allowed to talk about this, actually, but it's just gone public so...My housemate [Johnny], who I have lived with for a year, I introduced him to Courteney and they started dating," Ed told omg! UK. "Now they're crazy about each other." After splitting with David in 2011, we’re happy to see Courteney is happy again. And there’s no better way to celebrate a new relationship than by traveling the world together. We hope there are many more trips in the couple’s future! Have you ever been to Venice? If so, what are some things you must do before leaving? Tell us about them!